48 CINEMONTAGE / FALL 2015 Because visual effects elements may not be supplied until the first mix day, Lago says, "I'll crash down certain things to leave enough room in the track for the new sound effects." Davis elaborates: "Since we developed a collaborative workflow, I'll immediately see in the session what Peter has done and what will follow later, via clear labels. I fully understand the way he thinks, which can be a huge time saver." "Even without picture," Lago interjects, "I like to let Ryan know about my ideas using carefully labeled tracks." Davis confesses that he rarely gets to work with someone in a capacity where everything is so clearly labeled and laid out. "Ryan is very collaborative and never throws me under the bus!" Lago asserts. By way of an example, Davis recalls that in the last episode of the second season, "We had the actors rowing in a boat towards the City of Lights," to which Lago adds, "And then a giant sea monster attacks them. But we didn't see any solid visual effects until the final mix. What would it sound like?" Davis explains, "Our producer Tim Scanlan — who is also directing an episode in Season 3 — tells me a lot about what's coming up. And when the visuals arrive, I can tweak the tracks while Peter might be cutting a sweetener. That can be very handy because I don't have to stop the stage; I can always find something to cover. I might need to re-sync an element; maybe an arrow is now coming from the left and not the right. I'll open the Pro Tools session and use my controller to make those changes, so I don't need to pull Peter off his show." Both Davis and Lago readily concede that sound for a creatively challenging show like The 100 benefits greatly from their finely tuned teamwork. "Having that level of collaboration makes it so much easier for us to develop an immersive soundtrack in the time we have available," the re-recording mixer concludes. TRUMBO portraits by Christopher Fragapane D uring a motion picture project, additional time for editorial and re- recording means that, in theory at least, the sound effects team can work more closely over a longer period of time. For director Jay Roach's new film Trumbo, written by John McNamara and based on the 1977 book Dalton Trumbo by Bruce Cook, the key was to match filmed action with contemporary newsreels. The film, which opened November 6 through Bleecker Street Media, tells the story of the acclaimed screenwriter's career — which came to an abrupt halt in the late 1940s, when he and other Hollywood figures were blacklisted for their left-leaning political beliefs. Trumbo is played by Bryan Cranston, with Helen Mirren as his nemesis, Hedda Hopper. 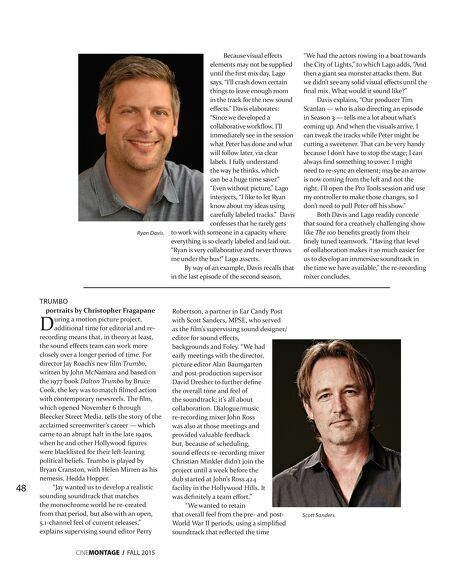 "Jay wanted us to develop a realistic sounding soundtrack that matches the monochrome world he re-created from that period, but also with an open, 5.1-channel feel of current releases," explains supervising sound editor Perry Anderson, a partner in Ear Candy Post with Scott Sanders, MPSE, who served as the film's supervising sound designer/editor for sound effects, backgrounds and Foley. 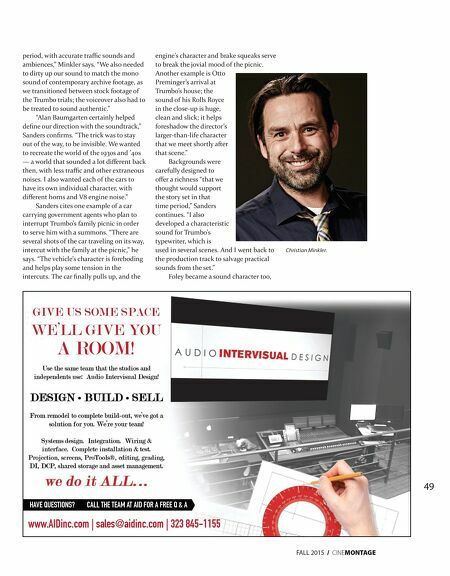 "We had early meetings with the director, picture editor Alan Baumgarten and post-production supervisor David Dresher to further define the overall tone and feel of the soundtrack; it's all about collaboration. Dialogue/music re-recording mixer John Ross was also at those meetings and provided valuable feedback but, because of scheduling, sound effects re-recording mixer Christian Minkler didn't join the project until a week before the dub started at John's 424 Post facility in the Hollywood Hills. It was definitely a team effort." "We wanted to retain that overall feel from the pre- and post- World War II periods, using a simplified soundtrack that reflected the time Ryan Davis. Scott Sanders.